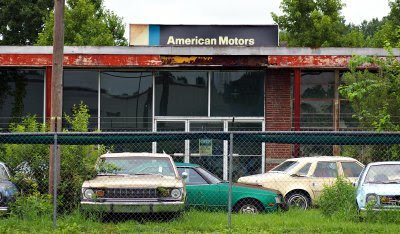 Stuck in some time other than our own, the AMC dealership in Pikeville North Carolina continues to operate and sell cars and parts. Some of the cars still have their original stickers in the windows. Apparently when AMC began retailing Renault in the late '70's/early '80's, Robert Collier didn't agree with this new direction and decided to concentrate only on AMC designed and built cars. It's an amazing sight. I just learned of Collier Motors from an article in my latest Hot Rod magazine. Wow!! took my breath away and brought me right back to a time and place that was unique, historic and will never be again the muscle car era. Found out about this site from a friend yesterday, we're both Pikeville locals and were teenagers back when this place was a real dealership. Honestly it's about time for a website like this one! The problem we have in this area is the hoarding of commercial type properties, especially that of defunct family businesses. It happens in just about every small town here out here. Some tend to think this occurs when the business owner simply cannot deal with their business going under, almost an ego thing. So rather than selling the properties or even just renting the place out for someone else, it sits there until something changes in the family or the property owner is forced to do something. Most of the time these properties are liquidated in real estate auctions, often at a loss. Even residential properties fall into this scenario. The owners simply state that they 'can't sell that house, cuz that was Momma's house' and that's it. Why did WRAL feel they needed to encourage or praise these people and what they do? 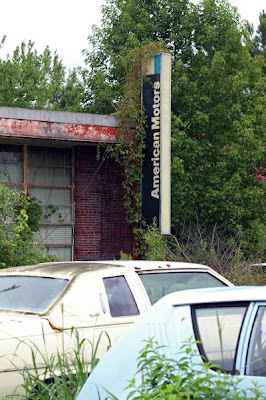 Collier Motors ceased to be a AMC franchise in 1977 or 1978. 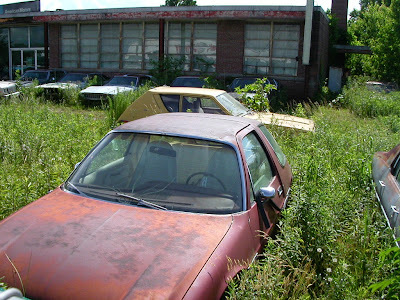 Granted, it is probably a eyesore and does need to be cleaned up and most of those cars are too far gone to be anything more than a glorified parts car to some AMC fan. To the poster with 'a very nice Food Lion & Dollar Store' across from this place you must be kidding me. Hard to get more white trash than that. Food Lion used to, and probably still does, change dates on their meats so good place to buy Green Eggs & Ham Sam I Am & slater it in expired mayo & bread from that old Dollar Store! If there actually IS a problem with this establishment instead of local merchants complaining, changed the damned laws. Change zoning, and have neighborhood improvement visit them, that is if there is a functional government not rural taliban tribe laws made up since you don't like something. I can imagine all the grease oozing from that new Andy's Burgers grease pit too that is if you have health inspectors there. And nothing says hypocrite that driving over there in 10mpg SUV with ozone wasting AC on full blast either. Yes, Collier Motors should have sold off most of the stuff there that is nothing more than flower pots rusted to ground, a fraction of the great cars they once were. And few of them are restorable, these photos first surfaced in 1998. That is THIRTEEN years ago. Cars in same locations, panels and wood falling down, at that time though no fancy schmancy Food Lion (hey nice pepper steak, no that ain't pepper it is larvae) or celebrity Dollar Store where locals gather to buy new clothes. and forced to clean up property, therefore all those junk cars go to scrapper, and weeds cleaned up, and building probably torn down as it appears in ruins. Hopefully Colliers will sell off all their junk and clean up property and those cars will go to some people who can possibly part them out to keep others on road. I will not hold breath on that as place still looks like bad episode of Ghost Adventures, same weeds, same cars, everything from 13 years ago. Good luck to the Colliers & hope it comes to peaceful and profitable settlement for all who might be involved should it get to that point! Thank God that they are there.. It is their business. All the hate is crazy. We love those cars, and anyone who is helping to save them.. I'm torn. I'm interested in seeing the place, but I agree that the overgrowth and decaying building isn't helping the situation. Spend a couple of weeks chopping the weeds and growth down, and tidy up the place. 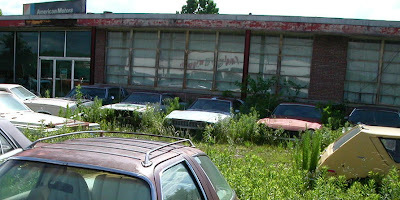 A lot of those cars are now junk because the rust has claimed them. They are nothing but parts cars now and it's a shame. I personally wish the Colliers all the luck in the world and hope they can do something about the place. If there's a sale to be made, make it. Move a car and clean the spot; move another one to the place. Something. To each his own is true in this country and I support that but it's a shame to see them just rust in front of you every day. Why is there absolutely no shame from the owners of this place? Are they unable to escape 1977-78? Some of the posters are trying to defend the owners by comparing apples to oranges! The various fluids that are likely leeching into the groundwater versus cooking grease from Andy's? Come on, be real. Like Sanford & Son, this is their Kingdom that unfortunately plagues both the town and the county with its ghetto curb appeal. Those of you who are not in the area, please realize that there is even a children's nursery adjacent to this salvage yard. What will it take to rid Pikeville of this place? I hate to think of the health hazards this place presents to the town and county 24 hours a day. A few weeks chopping weeds is a brief 'fix' as the weeds will grow back.. it bring unwanted attention as it would be an eye opener for those who have grown used to the current conditions! As far as the 'rezoning' and such, I suspect that the owner is one of area 'old money' families (although you'd never know it) and may have some Iown Hall influence. I don't know anyone who does that, neat if they do, but yeah, right. There are laws on books about dumping tires, restaurant grease, motor oils, gas, freon, anti freeze but guess what. It still goes on, not hard to find piles of tires on side streets or dirt roads. Freon outlawed years ago, R12, lots of it, still out there. Gas station close down? Tanks remain. Rotting. Feds think adding MTBE to gas makes it burn cleaner? Yup, you have over 10,000 water wells poisoned by it in California alone. Search for MTBE & Superfund before griping about someone having shame for old dilapidated building. bigger fish to fry. The poster from Feb 19th is correct, if there actually IS a problem, change laws & zoning or enforce existing laws if there is a city, county government. Obviously there is not a problem it local news is having fun with a positive story on a place time forgot. It has been some time since I last visited the Collier's location, but I recall it was still out in the country, not within the city. Perhaps the city has extended out that far? What I do know is that the Collier's are a class act, despite the appearance that may offend the "cookie cutter" sensibilities of some people. I absolutely understand how some can be offended by the rundown, "Sanford & Son" appearance. 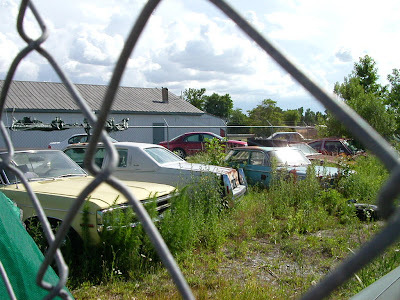 However, theirs is not a junk yard of abandoned vehicles, suitable only for scrap reclamation and being paved into yet another Wal-Mart parking lot. It is an active business, it has been so for longer than I suspect many of the critics have lived and their fair dealing, respect for history and support for classic enthusiasts across the country is well recognized. Perhaps, "live and let live" may apply here? I find it hard to believe that a car sitting in one place for several years will leak more toxic fluids than would be generated by several thousand cars generating toxic runoff within the same acreage? I suspect that some critics are not thinking this through very completely and are just throwing out knee-jerk responses to the fact that the property is "not pretty" and not like every other property. Perhaps a row of pine trees along the highway (71?) would protect the sensibilities of the critics, yet preserve this reminder that technology has consequences. I agree with the "live and let live" sector. We live right next door to a farm where the cows routinely allowed to walk right into a stream -- where they often do either #1 or #2 or both, right into the stream. The development on the other side of us has residences that have perfect lawns -- guess how they get them perfect? With CHEMICALS. In the winter, every time there is snow, the development gets treated with more chemicals to melt the snow -- which also eventually washes off into the same stream the cows are pooping in. The runoff from all of these activities poisons the local watershed. I don't complain about them; in fact I wouldn't think of complaining. For one, the response if I did would be to force the rancher to spend thousands of dollars putting up fencing around the stream, but the perfect lawn aficionados would keep right on washing their pollutants downriver; and the city certainly won't stop putting chemicals on the roads. So what would complaining really accomplish? Me, I have several old cars. None of them is leaking any more fluids than any of the other cars in driveways around the development. Leave the Colliers alone. They were there long before most of the complainers. They pay their taxes and don't to my knowledge, physically assault anyone. 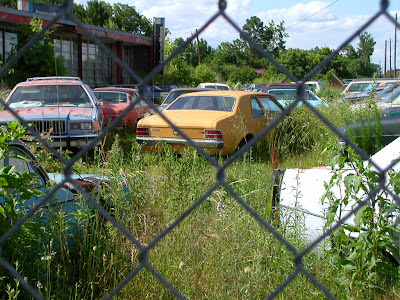 Only in busybody modern America is a "junky" yard a problem. In an America past, people mostly left each other alone to enjoy their own honestly-acquired property. I own a 67 American 440 and a 69 SC/Ramler. If I get a chance I would love to see this place. I would probably want to buy some vehicles also! I thaught I was the last of the AMC nuts left. I would love to own this property!!! I would make it live again for sure!!! How about someone working with the owner to restore the building and grounds to what it looked like in its "prime". This could be made to be a show place, sales and service for AMC products. I WOULD LOVE TO PURCHASE THIS PIECE OF PROPERTY. Clean it up....make a car and truck restoration business out of it. Make part of it a museum so vehicles like Mr. Goldwater's could be appreciated by the public. Collier Motors AMC was a awesome experience Mr.Collier was a very nice guy and was super happy to show use the place. He love all the AMC!!! They are his has past and passion. There where cars there that he sold new to people that he sought after to get back. The Cars there would make perfect restoration projects. There was hardly any rust on cars like I thought they would be. And he is still striding to sell people AMC Cars and help them with there AMC Today. He is doing his best to preserve the AMC and his dealership But for those who have been out hear it is a jungle the up keep in incredible. If your ever been out hear try to make a trip out of your way to meet him and see the dealership! After the May issue of are Colorado AMC Club news letter comes out I will post the article i wrote. This place is really cool. I'm surprised it hasn't fallen like all the other AMC dealers in the country. A few weeks of cleaning out weeds and some paint and it could be a cool place again. Too bad a lot of these cars are rusted beyond repair. To anyone complaining about property hoarding and the like, grow up. Sure the lot could be kept up but anyone whos ever lived in a rural area knows the sight of buildings decaying because of the amount of open space and the cost to demolish them. These people arent creating a problem here, theyre providing a resource for amc collectors to find cars and parts. it would cost a fortune to fix the building and landscape the lot, but this isnt an abandoned lot of cars, its an actual functioning buisiness and a rare example of commitment to a prodcut you feel is the best. i would like to visit this place myself. shame on all of you for bitching abnout the condition of the place or cars why don't some one help them clean it up.